In just about every worthwhile undertaking, we can be a watcher, a talker or a doer. In the interest of financial freedom, which one are you? If you chose doer, that’s great! However, you need a way to get there. 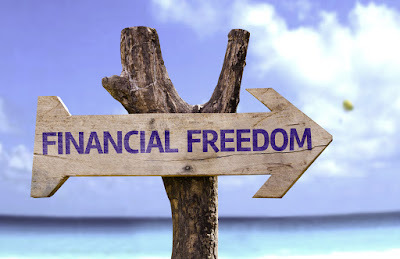 In this article, we will cover eight (8) tips to help you become financially free. Some of these will be related to your thinking, and others to actual steps to take. If you have $20,000 worth of assets (saved cash and investments), and $10,000 in liabilities (debt or anything you owe), then your net worth would be $10,000. This is what you want to track in your journey to financial freedom. Putting your outgo – your spending – to the best use possible will help you increase your net worth on your way to financial freedom. There are free tracking apps that can help you. Degree or no degree, continue to keep up with trade-related things that could increase your value as an employee. But if there’s a subject you have a passion for, keep deepening your knowledge and expertise. If you don’t have one, get one. Even college grads can get laid off. Obviously, part of the financial freedom equation involves earning more income. Transfer your expertise into a book or ebook, and publish it. The same can be done if you’re more of a creative writer. You could also sell physical goods on eBay, Amazon and a host of other places. It’s simple: pay yourself first. Out of every paycheck, take at least 10% and put it aside. You’d be surprised at how quickly that 10% adds up to a respectable chunk of change. This way you will have a growing sum to later invest, and you might be less inclined to spend unnecessarily. Bitcoin investment has become increasingly popular, and could be a way to diversify your portfolio. At the time of this writing, one bitcoin is worth $7,500. One helpful platform for bitcoin is Bitcoin Code. Check out the Bitcoin Code Test Results. 7. Who Do You Hang With? It has been said that if you want to be wealthy, you should hang out with wealthy people. Think about it. Who will give you the best chances of achieving that goal – someone who knows nothing about being rich, or a wealthy mentor who can help you? 8. Stick and Stay – She’s Gonna Pay! The late great Tom Petty had a song entitled, “The Waiting Is The Hardest Part.” Yes, patience is difficult for all of us in some way. But anything worthwhile is worth waiting for. Keep at it. It will pay off in due time. If financial freedom is your goal, then we hope that these 8 tips will help you get on track and stay there. Educate yourself, take practical steps and stick to it!